Children of Alexander Williamson and Jane Glen where known. James Williamson, born 21 Jun 1855, Bonhill. Janet Ellen Williamson, born 21 Jan 1857, Bonhill. Birth record from Glasgow parish register - Agnes, 6th October 1844, Witnesses William Elliot & John Williamson (William Elliot was an "uncle" of the baby Agnes being the husband of Helen Glen, the sister of Jane Glen, Agnes 's mother. Helen had married William, the son of John Elliot and Margaret Cowan on 15 Sep 1829 in Glasgow, Lanarkshire and around the time of these births\baptisms time William as a vintner at the "Burns Tavern" at 114 Trongate, just "up the road" from Alexander's "Kings Arms Inn. A William Elliot appears as an executor of the will of Jane Glen's father, Alexander Glen. John Williamson was Alexander's brother John, identified as son of Alexander and Agnes on the basis of his death certificate which gives his parents as Alexander Williamson and Agnes M.S. unknown, and the various censuses which give his place of birth as Airdrie \ New Monkland. with ages given on later censuses records and his death certificate give a date of birth circa 1818.) Married Ebenezer Hendry on born 17 Dec 1867 in Helensburgh. Next Generation in our Family History. Helensburgh. 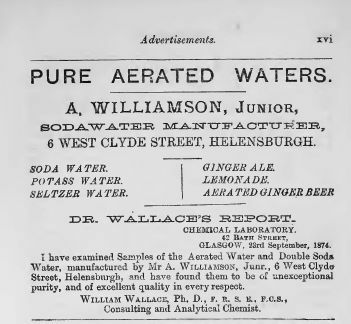 At the time of his marriage Alexander was living in Helensburgh, working as a Soda Water Manufacturer. Catherine was also living in Helensburgh, with no occupation stated. The witnesses were Thomas Craig and Jane Peat. Catherine Thomson Williamson, born 17 December 1873 in Helensburgh, Dunbartonshire. Alexander Williamson born 30 October 1875 in Blythswood Terrace, Helensburgh, Dunbartonshire. Violet Williamson born 6 September 1877 in 7 West Clyde Street, Helensburgh, Dunbartonshire. Nellie Williamson (twin) born 28 October 1879 in 7 West Clyde Street, Helensburgh, and died on 15 February 1881 in Helensburgh, Dunbartonshire. Jeanie Williamson (twin) born 28 October 1879 in 7 West Clyde Street, Helensburgh,, Dunbartonshire. Harry Williamson born 9 April 1882 in Bonnie Braes, Sinclair Street, Helensburgh, Dunbartonshire. For the census of 1881 Alexander Williamson (Jnr) was living close by the Queens Hotel, at 6 William Street, Helensburgh with his wife Catherine McConachie and four children Catherine born 17 December 1873, Alexander born 1875/76, Violet born 1877/78, and Jeanie born 1879/80, all born in Helensburgh, Dunbartonshire. Alexander's profession is still a "Soda Water manufacturer"..
1881 Census (4th April) Row (Rhu) (503) Book 8. Page 1. In his will Alexander left instructions for the sale of his assets, including his Aerated Water business, but excluding his "household furniture and silver plate". The proceeds were to be invested and the interest use to provide an income for his widow Alice and his children. However should Alice remarry his remaining effects were also to be sold and the proceeds to be split equally among Alexander's children, with the trustee's managing the monies or any any of the children whilst they were in "pupillarity or minority" for their "maintenance, upbringing and education." The inventory of the estate gives it a value of £3289 13 shillings and 1 pence, (approx £150,000 today), after payments of all debts and funeral expenses. The figure included £520 realised from the sale of Alexander's Aerated Water business which had been sold a few weeks after his death on 10 December 1886. As it transpired his widow, Alice, was to remarry three years after Alexander's death in London in 1889. It would seem that in 1889 the widowed Alice Caroline Williamson nee Cooper married the Revered Thomas Sandbach Dean, at Saint Andrews Wells Street, London. (Jan-Mar 1889 Marylebone Vol 1a Page 781). There is an application for a licence dated 26 January 1889 by "Alice Caroline Williamson, of the New Parish of St Andrews Wells Street in the county of Middlesex, a Widow" who "prayed a Licence for the Solemnization of matrimony in said New Parish Church of Saint Andrew Wells Street" between her "and the Recverend Thomas Sandbach Dean, Clerk, of the Parish of Old Buckenham in the County of Norfolk"., Thomas was the vicar in Old Buckenham, Norfolk. I believe that Thomas Sandbach Dean was the son of William Dean (born about 1824 in Reball, Cheshire, son of Thomas Dean and Eliza Dodd), and Jane Sandbach, (born about 1830 in Delamer, Cheshire daughter of Wiliam Sandbach and Charlotte Bennett) who were married in 1849. Thomas had siblings Charlotte born about 1853, Clara born about 1855 who married Francis Alexander Rennie Jul-Sep 1880 (Northwich - Vol 8a Page 333), Dora born about 1856, Ada born about 1858, Laura born about 1861, and Emily born about 1863, all born in Eddisbury, Cheshire. After their marriage the couple presumably went to live in Norfolk. Certainly Thomas was resident in the vicarage of Old Buchenham recorded as vicar for the census of 1891. However although he was recorded as married Alice is not recorded in the household and I suspect she is the Alice C. Dean recorded in the Clapham Maternity Hospital in Jeffrey Roads road, Lambeth, London. It is not unreasonale to assume that Alice was in the infirmary to give birth but as there is no record of a child of Alice's born in this year in the subsequent 1901 census it may well be that if the initial assumption is correct that the baby died in infancy. However the following year Thomas and Alice had what I believe to be certainly their only child to survive infancy, a son Louis Sandbach born 15 April 1892 and baptised 29 May 1892 Old Buckenham, Norfolk. Jane married George M. Anderson son of Adam Currie Anderson, a Railway Station Master, and Helen Murray on 5 Feb 1867 in Row, Dunbartonshire. At the time of her marriage Jane was living at the Queens Hotel, Helensburgh, with no occupation given. George was also living in Helensburgh at Ashgrove Cottage, working as a Coal & Commission Agent. The witnesses were Robert Darling and Helen Williamson. 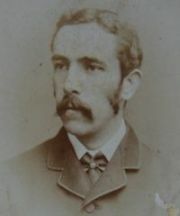 George was born 14 May 1845 in St. Cuthberts, Edinburgh. Adam Currie Anderson born on 6 Dec 1867 in Row, Dunbartonshire. Adam died aged 3 on 6 Jul 1871 in Sinclair St, Helensburgh, Dunbartonshire. Alexander Williamson Anderson born on 6 Dec 1867 in Row, Dunbartonshire. Alexander died aged 3 on 24 Jun 1871 in Sinclair St, Helensburgh, Dunbartonshire. George Murray Anderson born on 19 Dec 1869 in Helensburgh, Dunbartonshire. George died aged 17 on 3 Sep 1887 in Queens Hotel, Helensburgh, Dunbartonshire. Andrew Anderson was born on 2 Jun 1872. Andrew went to India sometime after the 1891 census and, on 10th December 1899 in Calcutta, India married Elizabeth Hendry, born 30 May 1874 in Glasgow, the daughter of his mother's sister Agnes Williamson and Ebenezer Hendry (m 1867, Helensburgh). This would have made them cousins. For further detail of the life of Andrew Anderson and Elizabeth Hendry click here. Moncrieff Mitchell Anderson born on 26 Feb 1874 in Helensburgh, Dunbartonshire. He emigrated to Canada on the SS Sardinian which sailed from Glasgow on 21 Mar 1903 arriving in Halifax, Canada on April 3. Moncrieff was recorded in the 1911 Canadian census for Moose Jaw, Saskatchewan, where he was living in 12 56th Avenue along with his siblings Ellen, Stanley and Mary and working as a clerk in City Hall. For the census of 1916 for Saskatchewan Moncrieff was still recorded as living in Moose Jaw, with his siblings Ellen, Stanley and Mary again recorded in the same household. His occupation was given a Agent - Real Estate. For the census of 1921 Moncrieff was recorded in Saskatchewan , District 221, Sub-district 51, Moose Jaw, Ward 3, Page 37, South Wood., in the household of his brother Stanley, Stanley's wife Margaret S. and their two year old daughter Margaret J.. Moncrieff and his brother are both recorded as "Real Estate Agents". Moncrieff died, on 13 Apr 1962 in Coquitlam, British Columbia, Canada. It would seem that he never married. Should you be able to provide any further information please get in touch via the Contact Page by clicking here. Helen Murray Anderson born on 23 Jun 1875 in 303 Sauchiehall Street, Glasgow, Lanarkshire. She emigrated to Canada along with her brother Stanley on the SS Lake Champlain which sailed from Liverpool on 28 May 1910 arriving in Quebec, Canada, on 5 June. She was listed in the ship's passenger records as going to her brother at Moose Jaw, Saskatchewan, having been an domestic and intending to continue in this role in Canada. It was at Moose Jaw that Helen was recorded in the 1911 Canadian census, living in 12 56th Avenue along with her siblings Moncrieff, Stanley and Mary and recorded as a house keeper. On her brother's attestation papers of 1914 she was listed as next of kin, and identified as a "Nurse, General Hospital, Vancouver, British Columbia". For the census of 1916 for Saskatchewan Helen was still recorded as living in Moose Jaw with her siblings Moncrieff, Stanley and Mary again recorded in the same household. Her occupation was recorded as Nurse. I have been unable to find Helen in the 1921 census for Canada. Helen died on 21 Jul 1959 in North Vancouver, British Columbia, Canada. It would seem that she never married. Should you be able to provide any further information please get in touch via the Contact Page by clicking here. Stanley John Anderson born in 1878 in Milngavie, Stirlingshire. He emigrated to Canada along with his sister Helen on the SS Lake Champlain which sailed from Liverpool on 28 May 1910 arriving in Quebec, Canada, on 5 June. He was listed in the ship's passenger records as going to his brother at Moose Jaw, Saskatchewan, having been an ironmonger but going to take up a new career as a farmer. It was at Moose Jaw that Stanley was recorded for the 1911 Canadian census living in 12 56th Avenue along with his siblings Moncrieff, Ellen and Mary and recorded as a Real Estate Clerk. In the autumn of 1914 Stanley volunteered as part of the Canadian Expeditionary force to go to fight in WW1. It would seem that Stanley had seen six years prior service with Glasgow Highlanders, presumably whilst in Glasgow, and, two years with London Scottish, presumably whilst the family were in London. Also when first in Canada he had joined the 60th Rifles of Canada Regiment at Moose Jaw, Saskatchewan. On his attestation form of September 1914 he was recorded as as born 8 July 1878 in Milngavie, Scotland with his next of kin being Helen Murray Anderson, a nurse at the Genneral Hospital of Vancouver. His occupation was given as broker and he was aged 36 5' 5", with a 37" chest (+2.5" expansion) and a "Fair" complexion, Grey eyes and Brown hair. Originally a Captain in the 11th Battalion he was drafted to the 7th Battalion Canadian Infantry. He sailed for England on the 4 October 1914 on the SS. Royal Edward before shipping out to France as part of the 5th Battalion in the March of 1915. His time at the front was brief but eventful. According to his service record he received a gun shot wound to the thigh on 6 May, May 18 (shrapnel wound right temple) and May 24, 1915 (gun shot wound corner right eye) at Festubert. (There is a mention of an earlier gun shot wound in his records on 6 May.) As a result of his wounds he was was evacuated back to England on 28 May to Mrs Mitchison's Hospital, 10 Cheyne Walk, Chelsea, before taking leave of absence and returning to Canada on the SS. Missanabie leaving Liverpool on 16 July and arriving in Quebec on 25 July 1915. For his conduct at Festubert he was awarded the Distinguished Service Order (DSO) as recorded in the London Gazette of which also gives the details of his actions. For conspicuous gallantry at Festubert on 20th May 1915 when he refused to go to the ambulance after being wounded until his tour of duty was completed. Captain Anderson was again wounded in the head on 24th May, but remained the whole night gallantly leading his men in the attacks. Stanley married Margaret Hutchison Ross Samuel whilst convalescing back in Canada on August 25, 1915. The marriage took place in Maine, although the groom's place of residence was given as Moose jaw and the bride's as Toronto. Margaret Samuel was born Margaret Hutchison Ross Samuel on 29 August 1879 at 27 Leven Street, Edinburgh, the daughter of William Samuel and Janet Windram. (For further details of the family and ancestry of Margaret Hutchison Ross Samuel - click here). I suspect that Margaret and Stanley were already "an item" having known each other back in Scotland. They were in fact third cousins (For details of their shared roots - Click here). Stanley returned to the UK on the SS. Corinthian on 24 October 1915. At a medical board at Caxton Hall he was found to be suffering from gunshot wounds and contusion to both eyeballs and passed unfit for General Service but fit for service at home. It would seem from a medical report of of September 1920 his injuries affected his sight and left him with a slight loss of equilibrium and a slight loss of confidence in traffic. For the remainder of his time in the UK he was attached to the General Staff of the Southern Army Imperial Force before returning to Canada in May. For the census of 1 June 1916 Stanley was recorded "at home" in Moose Jaw with his siblings Moncrieff, Helen and Mary with his occupation recorded as Agent - Real Estate. Shortly after, in the July of that year he was promoted to Major and served out the remainder of the war as a training officer at Barriefield and Valcartier camps being appointed Assistant Director of Military Training on from November 1916 through to his demob in March 1920. due to partial blindness from these injuries. For the census of 1921 Stanley was recorded in Saskatchewan , District 221, Sub-district 51, Moose Jaw, Ward 3, Page 37, South Wood. Also included in the household were his wife Margaret S. and a two year old daughter Margaret J. along with his brother Moncrieff. Stanley and his brother were both recorded as "Real Estate Agents". Stanley died at Shaughnessy Hospital, Vancouver on January 4, 1969. Margaret, his wife died on 30 May 1972 in West Vancouver, British Columbia, Canada. The death registration of Margaret confirms her as the daughter of William and Jeanette Samuel, born 29 Aug 1880 Edinburgh, Scotland. It is currently unknown as the what became of their daughter Margaret J. Should you be able to provide any further information please get in touch via the Contact Page by clicking here. Mary Samuel Anderson born in 1880 in Glasgow, Lanarkshire. She emigrated to Canada 1911. She was recorded in the 1911 Canadian census for Moose Jaw, Saskatchewan, where she was living in 12 56th Avenue along with her siblings Moncrieff, Stanley and Ellen and working as a telephonist in the telephone exchange. For the census of 1916 for Saskatchewan Mary was still recorded as living in Moose Jaw with her siblings Moncrieff, Stanley and Helen again recorded in the same household. her occupation was given as Supervisor - Telephone. I have been unable to find Mary in the 1921 census for Canada, nor any record of her demise. Should you be able to provide any further information please get in touch via the Contact Page by clicking here. Williamina Williamson Anderson was born in 1885 in Helensburgh, Dunbartonshire. Williamina died aged 6 on 10 Jul 1891 in 2 Sandbank Place, Partick, Glasgow. For the census of 1871 Jane and her husband were living at 23 Lomond Street, Helensburgh along with their twin sons Adam and Alexander and baby George. For the 1881 census Jane and her family were living at 9 Newhall Terrace, Barony, Glasgow. Neither of the twins were included in the household, or cannot be found elsewhere in the 1881 census, so it is possible they had died in infancy. George's occupation had changed "Writer and Accountant". 1881 Census (4 April) Barony (644-1) Book 40. Page 10. 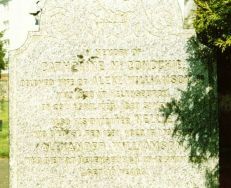 Sadly Jane Elliot Anderson, nee Williamson died aged only 42 on 26 November 1890 at 2 Sandbank Place, Partick, Glasgow. Four months later for the census of 1891 her widowed husband George was living at the same address with his six surviving children. The next record we have is that of George Anderson's demise aged 62 on 24 October 1907 in Fulham, London. The death certificate gave his address as 4 St Oswald's Road, Fulham and his occupation was described as "of independent means". The informant was Helen, his daughter, of the same address. This suggests that George had moved to London with at least his elder daughter. It would seem that the death of their father prompted his children Helen, Stanley and Mary to follow their brother to Canada as Helen and Stanley were to emigrate in 1910 and Mary was to follow in 1911. Birth record from Glasgow parish register - Helen, 3 July 1852, Witnesses - William Elliot & Thomas Powers ((William Elliot was an "uncle" of the baby Agnes being the husband of Helen Glen, the sister of Jane Glen, Agnes 's mother. Helen had married William, the son of John Elliot and Margaret Cowan on 15 Sep 1829 in Glasgow, Lanarkshire and around the time of these births\baptisms time William as a vintner at the "Burns Tavern" at 114 Trongate, just "up the road" from Alexander's "Kings Arms Inn. A William Elliot appears as an executor of the will of Jane Glen's father, Alexander Glen. Thomas Powers, retired proprietor, appears as a resident at the King's Arms Inn in the census of 31st March 1851.) Helen probably died in infancy. John married Minnie Florence Ashton daughter of Edwin Ashton, a Superintendent Engineer, and Mary J. Gooding on 16 Nov 1895 in Row, Dunbartonshire. At the time of his marriage John was living at 8 Waverley Gardens, Crossmaloof, Glasgow, working as a Mercantile Clerk. Catherine was living at Rocklea, Helensburgh, with no occupation stated. The witnesses were James Kinghorn and Ada Ashton, Minnie's younger sister.. Minnie was christened on 20 May 1866 in Pentonville, London. John and Minnie had one known child, John Williamson, born on 7 Jan 1897 in 38 Westfield St, Crossmyloof, Glasgow. Sadly Minnie died aged only 32 of heart failure on 5 November 1898 at 38 Westfield Street, Crossmyloof, Glasgow. The informant was John Williamson, her husband, and she was recorded as the wife of John Williamson, a Mercantile Clerk, and her parents were conformed as Edwin Ashton, a Superintendent Engineer ay Post Office, and Mary Jane Gooding. For the census of 1901 John and his son were living in "digs" at 132 Stockwell Street, Glasgow. 1901 Census (1 April) Barony (644-7) Book 4. Page 19. 1911 Census (2 April) Hutchesontown (644-10) Book 7. Page 12. John died on 17 February 1926 at 22 Weir Street, Glasgow. He was recorded as a Mercantile Clerk, the widow of Minnie Florence Ashton, and his parentage was confirmed as Alexander Williamson, Hotel Keeper, (deceased) and Jane Glen (deceased), with the informant being his son John. He is commemorated on the family headstone in Helensburgh graveyard. John and Minnie's only child John married Rhoda Forrest Landels daughter of John Landels and Janet Aitken Johnstone on 8 Sep 1933 in Newton Place Church, Partick, Glasgow. Rhoda was born in 1905 in Partick, Glasgow. Rhoda Forrest Williamson nee Landels died on 8 Aug 1980 in Helensburgh, Dunbartonshire and John Williamson died on 27 Sep 1990 in Helensburgh, Dunbartonshire. Their descendants live on in Helensburgh. James Williamson, born on 21 Jun 1855 in Bonhill. James's birth certificate includes the information that including himself his mother had had four boys - one of whom had died and four girls - one of whom had died. The son that had died was John Powers born on 9th October 1850 in Glasgow. The daughter that had died was almost certainly Margaret born on 15th March 1843 in Glasgow. James educated at Springfield Academy, Helensburgh and I believe went on to serve an apprenticeship as a marine engineer with Messrs Denny and Co. He went to sea in 1878, as fourth engineer in the service of the British India Steam Navigation Company. For the 1881 census he was at the Station Hotel, Stirling with is sister Agnes and her husband Ebenezer Hendry. It may have been while in Stirling on a visit such as this that James met his future wife Janet McCall. Janet was the daughter of Peter McCall and Agnes Shearer who I suspect at the time were proprietors of the Bluebell Hotel in Falkirk. Certainly this was the location of the wedding of James and Janet on 7 September 1882 with Janet's father, Peter, being identified as "Hotel Proprietor". Peter had been the licensee of the Eureka Bar, 359 Springburn Road, (corner of Gourlay Street), Glasgow, from 1875 and he and his family initially were living at 297 Springburn Road but by the time of the 1881 census they had moved to 5 Flemington Street. In 1882 a James Newton became the new landlord of the Eureka so I assume that Peter had not long moved to Falkirk at the time of his daughter's wedding. The date of James's wedding coincided with him obtaining his chief engineer's certificate at Glasgow no doubt increasing his status and more importantly his pay. The birth of James and Janet's first child, a daughter Agnes Shearer Williamson, was registered on 10 June 1883 in Helensburgh, Dunbartonshire, and shortly thereafter James and Janet emigrated to New Zealand where in 1884 he joined the Union Steamship Company of New Zealand, becoming a chief engineer in its service in 1889. James and Janet's only other child Alexander (Jock) Williamson was born in 1891 in Dunedin, New Zealand. In 1902 he left his last ship, the S.S. “Wakatipu,” trading from Sydney; to become the Inspector of Machinery for the South Canterbury district of New Zealand. Click here and scroll down to see the original source of this information and photograph. James died, aged 75, on 28 June 1930 Waikouaiti, New Zealand. His wife Janet lived on into her nineties finally passing away on 11 July 1955, also in Dunedin. James and Janet have descendents in Australia, through their daughter Agnes. Janet Ellen Williamson, born on 21 Jan 1857 in Bonhill. Janet seems to have been known as Helen or Nellie rather that Janet. 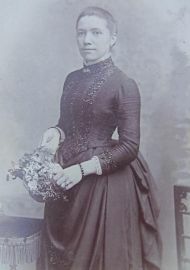 It is as Helen that she married John Fletcher Geddes son of Hugh Montgomerie Geddes, a Sheep Farmer, (recorded as deceased by this date), and Henrietta Cameron Fletcher on 23 October 1888 in Helensburgh, Dumbartonshire. At the time of her marriage Helen was living at the Queens Hotel, Helensburgh, with no occupation given. John was also living in Helensburgh, at Woodbank, working as a Glass Manufacturer. The witnesses were James Arthur Reid and Christina Mills MacDonald (daughter of a local restraunteur). John was born about 1856 in Australia, (where his father sheep farmed??). Montgomery born in 1889 in Helensburgh (Row). Douglas John Martin Geddes born on 22 January 1895 in Brandon, Manitoba. His birth is recorded in the Manitoba Vital Statistics with only the forename Martin and his mother recorded as Helen Willaimson. It would seem that Helen may have not made a "good" marriage. This is based on the following extract taken from the aforementioned letter written by her niece Agnes Shearer Williamson shortly before her death in 1968. I am indebted to Agnes's descendents for making this letter available. "Aunt Nellie married a man who was a proper rascal and hypocrite. He led her an awful life. Went to Canada and returned on a "cattle" ship with neither money or clothes. The other families would have nothing to do with them. I saw Aunt Nellie in London, living in a miserable room, with her son Monty, who was like his father, first the "perfect gentleman" in manner etc. but no good. He eventually got into money trouble and committed suicide by putting his head in the gas oven. His mother died of shock not long afterwards"
Certainly the family did indeed go to Canada. 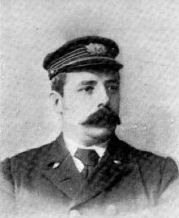 They left Glasgow the year after the birth of Albert sailing on board the SS Vancouver which left Liverpool on 11 May and arrived in Montreal on the 21 May 1893. They were listed on the passenger manifest as Gent and Lady respectively and would seem to have had their own cabin. On 22 January 1895, a couple of years after their arrival in Canada, their third son Douglas John Martin Geddes was born in Brandon, Manitoba. Only 5 months after the birth of Douglas the family returned from Canada. The sailed from Montreal on the SS Labrador arriving in Liverpool on 25 June 1895, although it would seem that John and family may have disembarked in Glasgow. It may well be that the statement in Helen's niece's aforementioned letter viz "returned on a "cattle" ship with neither money or clothes" may well have had some truth as although the Labrador was not a cattle ship the family were travelling steerage with John listed as a "Labourer". A bit of a turn around from the journey out. By 20 January 1896 the family had moved to London as there is a record of the baptism of Douglas John Martin Geddes at the Islington Presbyterian Church, father and mother - John Fletcher Geddes and Ellen Williamson. For the census of 1901 the family were recorded ar 15 Oxford Terrace, Islington with John working as an "Insurance - Inspector of Agents", an occupation that sounds although the family's circumstances had improved. The occupations of the neighbours eg. Cabinet Maker, Silversmith suggest a reasonable neighbourhood. NB the family are indexed under Gerds in Ancestry and Gedds in Findmypast!! For the census of 1911 they were living at 43 Gladesmore Road South Tottenham, London, in a dwelling of 5 rooms. The size of house and the occupations of the family don't suggest that they were, at least at this moment in time, too badly off. The census records that John and Helen had been married for 22 years and had 3 children all of whom were still alive. For World War 1 all of their three sons all enlisted in the London Regiment and even John aged 60 was recruited to the Royal Defence Corps with the Rank of Lieutenant. Sadly their youngest son Douglas was killed on 27 December 1917 and although Montgomery never saw active service the rigours of army life seem not to have been suited to his possibly somewhat neurotic nature. A year to the day after the signing of the Armistice which marked the end of World War 1 on 11 November 1919, John Fletcher Geddes died aged 64. His death was recorded as occurring at 61 Fairview Road, Stamford Hill, London, Middlesex. (Ref. Oct-Dec 1919 Edmonton Vol 3a Page 520). He left £170 15s 1d in his will (equivalent to just over £6000 today) and named Montgomery Fletcher Geddes, Insurnace Clerk, as executor. In 1939 Ellen's eldest son Montgomery who it would seem remained single and living with his mother took his own life as recorded in the aforementioned letter written by Agnes Shearer Williamson. "Monty, who was like his father, first the "perfect gentleman" in manner etc. but no good. He eventually got into money trouble and committed suicide by putting his head in the gas oven. His mother died of shock not long afterwards".) His demise was recorded in the second quarter of the year and as suggested in the letter this suicide may well have hastened the demise of his elderly mother as Helen as she passed within months if not weeks. Her death was recorded on 6 July 1939 aged 83 at the Middlesex General Hospital. (Ref Jul-Sep 1939 Edmonton Vol 3a Page 784.) Her usual address was given as 55 Fairview Road, Tottenham, London, Middlesex, although this may well be that this was the same house as 61 and the houses had been renumbered. She left an estate valued at £280 11s 6d (equivalent to nearly £13000 today) with Lloyds bank named as executor. She died in 1858 in Row REF 503/00 0094, aged 0. William Cunningham Patterson, was seemingly named after a lodger recorded at the Queens Hotel for the 1861 census - "William Cunningham Paterson, a "Landed Proprietor"
William, a bank clerk, married Eliza Nidrick Jarvie daughter of Nidrick Jarvie, a rope spinner, (recorded as deceased by this date), and Eliza Miller on 3 Oct 1894 in the Windsor Hotel, St Vincent St, Glasgow. At the time of his marriage William was living at 21 Lansdowne Crescent, Glasgow, working as a Bank Clerk. Eliza was living just up the road at 21 Lansdowne Crescent, Glasgow, with no occupation stated. The witnesses were James Kinghorn and Agnes Williamson Hendry. Eliza was born about 1873. Dorothy Glen born about 1896 in Maryhill, Glasgow, and died on 24 October 1964 in Bonhill, Dunbartonshire. Commerated on brother's headstone next to the original Williamson headstone in Helensburgh graveyard'. Alexander Nedrick born 20 Jun 1899 at 4 Albany Street, Maryhill, Glasgow. Alexander married Isabella Mathieson Hunter daughter of Robert Hunter and Isabella Mathieson. Isabella was born about 1894. She died on 9 Dec 1958 in Victoria Hall, Sinclair Street, Helensburgh, Dunbartonshire, and was commemorated on a headstone next to the original Williamson headstone in Helensburgh graveyard. She was recorded on her death certificate as the wife of Alexander Nedrick Williamson, Hallkeeper, and the place of death was given as Victoria Hall, Sinclair Street, Helensburgh. Her parents were recorded as Robert Hunter, a shipyard draughtsman, and Isabella Mathieson, both deceased. The informant was Elizabeth J. Williamson, their daughter. Alexander himself died on 28 December 1979 in Helensburgh, Dunbartonshire. Alexander and Isabella had one known child, Elizabeth J. Williamson. William Miller Williamson - born 1902 in Maryhill, Glasgow. Informant on his father and mother's death certificates. Possibly died in 1971 as there is a death of a William Miller Williamson recorded for 1971 in Helensburgh. For the census of 1901 William and this wife and two children, plus a general servant, Susan Tierney, were living at 4 Albany Street, Maryhill, Glasgow. For the census of 1911 William had moved back to Helensburgh with his family and was living at 15 Craigendoran Avenue, Helensburgh. The family had grown with the addition of a son William Miller who was born in Maryhill in 1902 prior to the move to Helensburgh. Sadly the census records that a fourth child had been born to William aand Eliza but had died prior to 1911. William died on 4 Aug 1953, still resident at 15 Craigendoran Avenue, Helensburgh. He was recorded as a retired Banker, married to Eliza Nedrick Jarvis and his parents were confirmed as Alexander Williamson, Inn Keeper, and Jane Glen. The informant was William Williamson, his son, who gave his address at the time as 262 Nithsdale Road, Dumbreck, Glasgow. Eliza, his wife, died on 8 Jan 1957 also still resident at 15 Craigendoran Avenue, Helensburgh. She was recorded as married to William Cunningham Paterson Williamson, a banker, and her parents were confirmed as Nedrick Jarvie, this time recorded as an Oakum Manufacturer, (deceased), and Eliza Miller (deceased). The informant was William Williamson, his son, who again gave his address as 262 Nithsdale Road, Dumbreck, Glasgow. They are both commemorated on the family headstone in Helensburgh graveyard. She died in 1864 in Row REF 503/00 0137, age not given in index but should have been 2. She died in 1866 in Row REF 503/00 0044, aged 2. She died in 1871 in Row REF 503/00 0074, aged 4. Named after her father's married sister Margaret Williamson who had married a John Craig in 1832.